how can I get the quantum leap effect on some video footage I have got? please if anyone knows I need to know! I am having the quantum leap theme tune in the background and then at the end having me leap out. thanks for your time Oh boy! It's the best leap effect I've seen yet. Oh and welcome to Al's Place. Hope to hear from you in the future..... or the past! Thanks Ziggy but I'm unwilling to tell anyone how to achieve this effect untill such a time as the project has been finalised and the full film released. I know that might seem a bit selfish but I don't want copycat footage all over the place before I get my own film out. 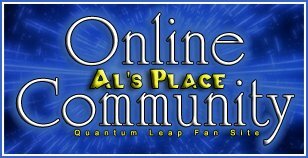 That said though when Quantum Geek has finally been released I will be releasing a full video tutorial on www.stevetrek.com so that others can replicate the video. Oh thats ok. I think I have worked out a similar effect using some software called adobe after effects and particleillusion. Maybe you have heard of them? Yeah they're the programs that I use... did you email me some time ago about this or something? no why would you think that? I had never even heard of you before. I think I have also figured out how to the al hologram effect using the sam programs. did u use them as well didnt u?